The flexibility robots provide meets the wide variety and responsiveness required for the facility. With Seegrid robots they can train a new route and it can be operational within minutes. The robotic pallet trucks gave American Packaging the labor savings and safety solution they were looking for. We are in the early stages of unmanned systems being used on the battlefield. While robots are being used in a growing number of missions, work continues on the research side to integrate new systems and capabilities to continually expand their value on the frontlines. Travis Deyle at Hizook has some interesting info about Redwood Robotics, a Silicon Valley startup with backing from Willow Garage, Meka Robotics and SRI. The company has been in stealth mode for the past year but yesterday at an event in Menlo Park they announced the first real statement about their plans for the company. At the event Aaron Edsinger, who is CEO of Meka Robotics, said the goal of the new company would be: "To enable the personal and service robot markets through a new generation of robot arms that are simple to program, inexpensive, and safe to operate alongside people." Sounds like a smart plan. Be sure to read Deyle's full post over at Hizook. The Artisans Asylum in Boston Massachusetts s a non-profit community craft studio. In their next robotics class their goals are fairly simple: build a car-sized two-person hexapod robot and ride it. What makes their plans different from the scribbling of every 12 year old who just found Japanese animation is that the guys teaching the class have worked on projects real projects like Boston Dynamics PETMAN, AlphaDog and BigDog. Hizook does a good job of summarizing what Artisans Asylum is and Stompy. The project is still in the conceptual stages but the team has a blog with some of the tests and presentations they've done so far. The ExoHand from Festo is an exoskeleton that can be worn like a glove. The fingers can be actively moved and their strength amplified; the operator's hand movements are registered and transmitted to the robotic hand in real time. The fingers can be actively moved and their strength amplified; the operator’s hand movements are registered and transmitted to the robotic hand in real time. The objectives are to enhance the strength and endurance of the human hand, to extend humans’ scope of action and to secure them an independent lifestyle even at an advanced age. . Tactics and tips for solving arc welding problems using sensors and machine vision. Last weekend was RoboGames 2012. IEEE Spectrum‎ has posted a few videos from the Mech Warfare competition where robots battle inside a miniature model city. The videos contain several Each robot is controlled remotely, and the human pilot sees only a first-person view from the perspective of a wireless camera mounted on the front of the robot. Each robot is equipped with pressure sensitive plates that register hits from airsoft pellets. ROS Fuerte Turtle the fifth ROS ROS distribution release is now officially available. 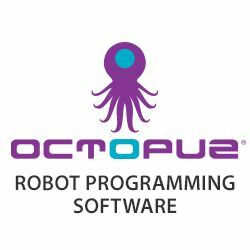 ROS Fuerte has major improvements that make it easier to integrate with other software frameworks and tools. This includes a rewrite of the build system, migration to the Qt framework, and continued transition to standalone libraries. A detailed change log as well as installation instructions are available here . While every operation brings a unique set of requirements and challenges, three sample applications that utilize barcode and machine vision technology to ensure labeling accuracy are outlined in this paper. Diatom design studio are developing an open source drawing robot kit that they hope to sell for just $70 dollars. The kit: "Piccolo", will be powered by an Arduino board, and supports movement along X, Y or Z axes. You can attach a pen, pencil, brush or possibly even an X-Acto knife and it will draw out any sketch you upload to it. They plan on including Arduino and Processing libraries that will allow you to develop dynamic drawings using sensor data. In the video below the prototype draws procedural tree sketches that vary according to the bots proximity to a light source. The kit isn't available yet but on Diatom's website you can sign up now to their mailing list. Just days after announcing the DARPA Robotics Contest the DARPA website is reporting that Boston Dynamics has been selected as a "sole source" to develop and build the humanoid robots for the contest. Boston Dynamics will build 8 identical humanoids, which will be based on PETMAN. IEEE Spectrum has the full story here . The Pentagon’s research and development agency has announced a contest to develop ground robotic capabilities to execute complex tasks in dangerous, degraded, human-engineered environments. The program will focus on robots that can utilize available human tools, ranging from hand tools to vehicles.The DARPA Robotics Challenge will consist of three key events – a Virtual Disaster Challenge, and two (2) Disaster Response Challenges. Participation in the Virtual Disaster Challenge is required only for teams working exclusively on control software development. The agency has not yet announced how much it intends to spend on the program or the size of the prize but previous contest awarded two million dollars for the top prize with one million dollars for the runner up. The full contest details and registration can be found here . Why are there more unmanned platforms than customers? Why are unmanned systems developers offering so many different kinds of platforms and ideas, when there is comparatively little demand by the civilian market? Why are there more offerings than customers? Headquartered in Solon, Ohio, HDT Global is widely recognized as the world leader in the design and manufacture of many products in use by U.S. and allied military units, civilian governments, and commercial customers today. Is Your Business Employing Automation? It will be worth your time to analyze each segment of your business and decide if automation is right for your business and if automation can produce more efficiency or profit.